Then driving to the Waterfront in Cape Town I see spray-painted on a sign at the entrance: “Rodriguez Alive at the Velodrome 6/7 March”. If that isn’t enough excitement for one day I see Eva’s comments on The Forum: “My father is alive and well. We are on our way to South Africa to tour”. Who would have believed it? 6 months ago I thought he was dead, now he’s coming to perform in Cape Town! Radio Good Hope announces “Rodriguez is coming to South Africa!” and plays a snippet of “I Wonder”. Cape Times confirms Cape Town concerts. I bought my ticket today for Saturday night, 7th March front row. The sign at the Waterfront has gone, replaced by “Respect Our Planet” or something! Article appears in The Star in Johanneburg about the forthcoming tour. I found out today that Rainbow Productions are the company handling the publicity for the tour. Interview in Mail & Guardian by Craig Bartholomew. The band will open the concert with acclaimed frontman, Steve Louw, performing all Big Sky’s greatest hits. Hard in rehearsal already, the band are preparing for Rodriguez’s arrival and ensuing rehearsals, to ensure that avid fans will not be disappointed by the quality of the sound. Fans can anticipate all the great tracks from Cold Fact and more. Posters for the Cape Town concerts start appearing around Cape Town. Old Mutual Direct welcomes Rodriguez to South Africa. Today Rodriguez and his entourage leave Detroit to begin their two week/six date South African tour. We at the Great Rodriguez Website are proud to have been part of the process that has resulted in this tour and wish Rodriguez and all his family a successful tour and an enjoyable stay in our country. Your much anticipated visit is truly the answer that will make all those questions disappear. A night I’ll never forget. What a thrill! The guy is cool, laid back, friendly, open. He thanks me for my efforts with this website and answers my inane questions about album releases, musicians, etc. Zev Eizik, Rodriguez’s manager (and Rodriguez family friend) gives me an original 1977 vinyl copy of the Australian-only album At His Best and Rodriguez autographs the lyric sheet for me! I meet Eva, Konny (Rodriguez’s wife) and Regan his third daughter. 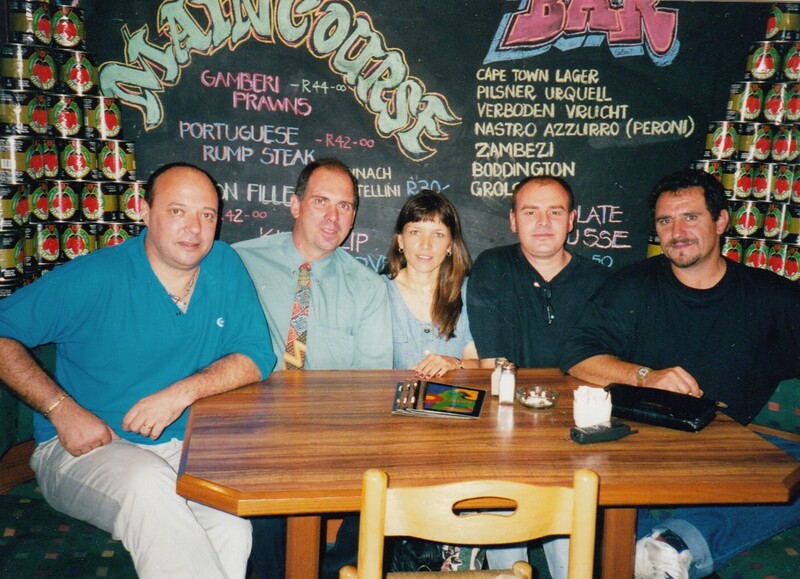 They laugh when they tell me that they knew where Rodriguez was all the time! Sandra couldn’t be here because she’s just had a baby – the Man is a grandfather! 7 a.m. Rodriguez interviewed on The Breakfast Club TV program (SABC 2). 10.30 a.m. Eva, Sugar, Craig and Brian meet at Nino’s in Cape Town. 7.30 p.m. Rodriguez interviewed on Front Row TV program (MNET) and performs an “unplugged” solo version of “I Wonder”. 12 p.m. I attend an hour of rehearsals at the Velodrome (after delivering the lyrics for A Most Disgusting Song at Eva’s request!). They rehearse “Sandrevan Lullaby – Lifestyles”, but don’t perform it at the concerts! 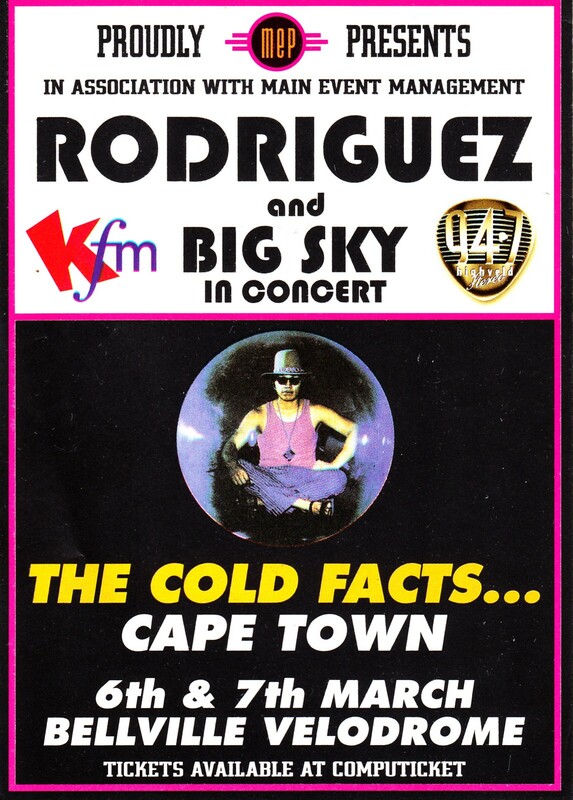 9.30 p.m. Rodriguez rocks Cape Town. He appears on stage to a standing ovation and everybody sings along to the songs. What a performer, what a show! Another great show, even better than Friday night. This man is a legend – no new album, no single on the charts yet he attracts huge audiences from all age groups! …I had the pleasure of seeing the great man at the Standard Bank Arena in Johannesburg and it was awesome!!! Truly great concert. Craig Bartholomew says that he met Sandra (Rodriguez’s daughter) after the show, so she must have just arrived, because she wasn’t in Cape Town. 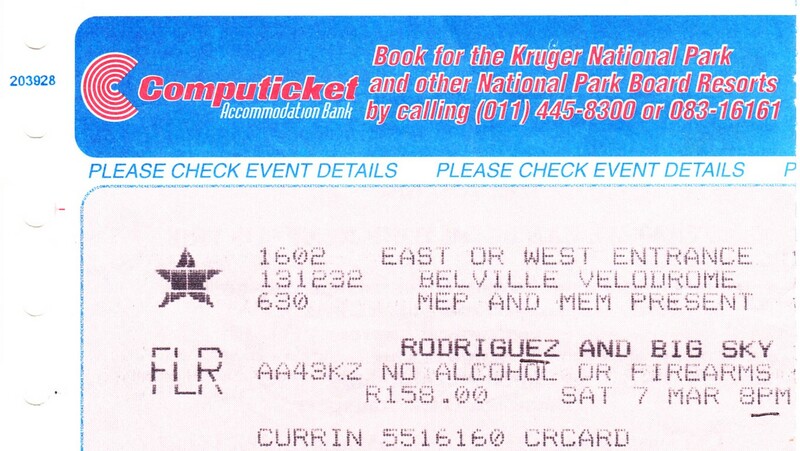 Went to see Mr Rodriguez live, on stage, in SA tonight – what an utterly amazing experience. I can now die a happy woman. Oh, about the Allenby Campus (Bramley) appearance – it was amazing!! He appeared at the music school there the one morning. I can’t remember the exact date but I can try find out for you if you want… (wait now that I think of it, it was the day of his 1st or 2nd JHB concert). He arrived there the one morning and headed for the practice room where the students perform – on his way there, he walked passed me and greeted me and asked me how I was doing, etc. Anyway, from there he went to the stage where people were allowed to ask questions, etc. He answered all of them and I found him to be extremely intelligent and he was very polite – when someone in the audience sneezed he said, “bless you”. He also performed 3 songs for us: Sugar Man, I Wonder and some other track he said was going to be on his new album. This was especially cool ’cause there were only like 100 people in the room – it was amazing. And afterwards he signed autographs for about half an hour… I got one! When I approached him, he kept thanking me for having him there… I think I told him that I loved him and I remember saying to him, “thanks for the music, man!”. I went to the concert at the Carousel & was amazed. I am a new fan, don’t know much about the background to Rodriguez or his music, but I loved the concert. I found his interaction with the crowd amazing, he came across as down to earth, sincere & totally amazed by the roaring of the crowd for more. The Rodriguez Concert was undoubtably the greatest I have ever attended. Only a great person could be so humble; reading his sheets and squinting and touching the audience. …and don’t try to enchant me with your manner of dress ‘cos a monkey in silk is a monkey no less. Genius. What a tour, what a man, what memories – the mystery is gone, but the magic continues forever. Show-openers for U2, Just Jinger, cover Sugar Man at the Green Point stadium and everyone sings along! 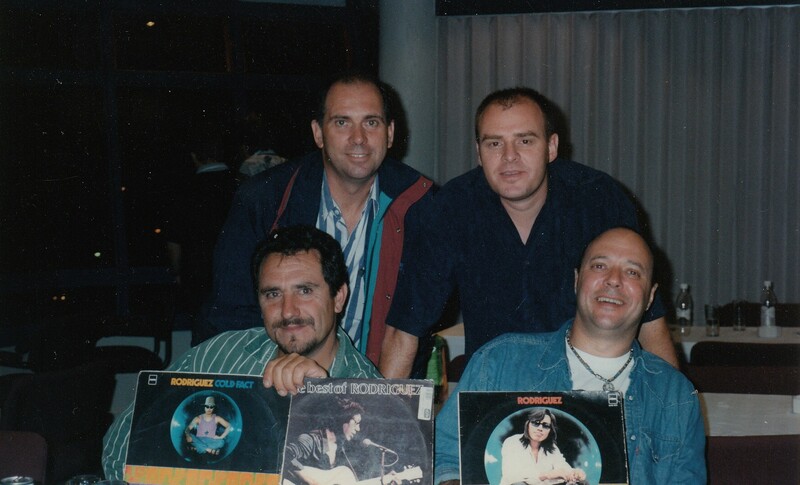 Highveld Stereo plays I Wonder at number 88 on their All-time Top 100. I bought Just Jinger’s new CD today at Top CD and noticed at Musica in Claremont that Cold Fact was number 11 in their Top 50 sellers! Titanic was number 1 (of course). I reviewed your comments, impression and responses. This is my first message on the “net”. We are at Wayne State University Library, Detroit, Michigan. I have been in Detroit for about a week. The RSA (Republic Of South Africa) was an extraordinary event for me. Thank you for your thoughts, kindness and energy. I will stay posted and will respond further as soon as I get my equilibrium back. News report appears in USA Today about SA tour. So, Rodriguez’s tour of South Africa is over. Less than a year ago the possibility of this happening was so unthinkable that there were actually people in SA who didn’t go to the shows believing it was a hype! 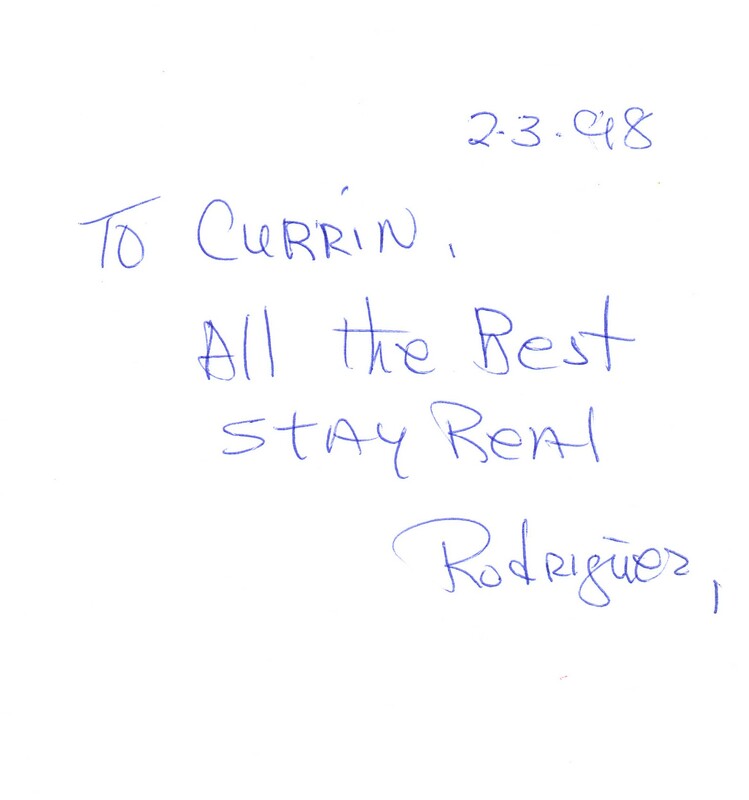 The tour was a wonderful success from every aspect and the Cult of Rodriguez keeps growing. The word has gone around the world about this event and requests for tours have been received from Toronto, Augusta, Australia, New Zealand and the UK. We are also honoured to have a message on this web-board from Rodriguez himself who, I believe, is getting cyberactive to monitor his two websites. In the March 26th edition of USA Today, the global US newspaper, there is an article by Ellis Cose who is a contributing editor for Newsweek magazine. It is an article titled “Singer embodies So. Africa’s hopes” and is, to my knowledge, the first article about Rodriguez to appear in any American publication. There is talk of a video documentary that was shot during the tour, the possibility of a release of a live CD from the tour and the added possibilty of a new album by Rodriguez. Please watch this space for further news. 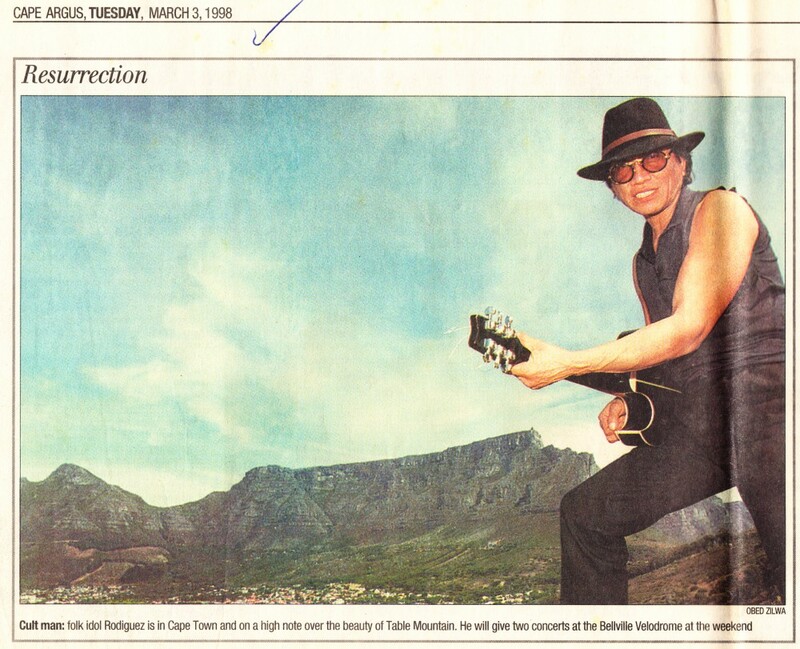 I was also one of a number of people who were interviewed for an article to appear in the Wall Street Journal during the next few days, also about Rodriguez and his SA tour. Seems America is waking up to the existence of this unknown star in their midst. About time too! I guess we have to thank the American pres. Bill Clinton for this as due to his visit here, there were a number of journalists hanging around SA and while they were here, the whole Rodriguez tour phenomenon happened and caught their attention. I firmly believe that we are seeing the beginning of Rodriguez’s world-wide revival. It is a fact that George Bernard Shaw’s plays were only produced for the first time when he was 94 years old. Rodriguez is far younger than that and is in great shape both physically and mentally. The timelessness of his songs and music, as evidenced by the SA concerts and the number of messages on this web-board, is a clear indication that the new Rodriguez era has just begun. Couldn’t happen to a cooler person. We South Africans thank Rodriguez for his time, his music, his grace, friendship and generosity and most of all… for bringing back all those colours to our dreams!! Sony Music SA recently recorded Rodriguez’s second Standard Bank Arena show for release on CD. The album will be entitled Live Fact and is scheduled for a late April release. Radio Metro play a rap / hip-hop version of I Wonder, performed by Generation EXT. This is the very first time this re-make is being played on air. Vocals by Philippa Berrington-Blew and rap by Tazz. Produced by Barry Dean and co-produced by Craig Bartholomew. “Sounds good to me” says DJ Wilson B Nkosi. This song is as yet unlicensed to any label, but I believe various major labels are interested. This track is chosen as the hit-pick of the week and will be played every evening around 11 p.m. Cold Fact is at number 30 in Musica’s Top 50 sellers. Not bad for an album first released in SA in 1971 and more than a month after the tour. Just Jinger release their new video, Live, Unplugged & Backstage which includes a live and unplugged version of Sugar Man recorded at the Little Theatre, Pretoria on the 17th October 1997. Tonia Selley tells me she is directing a film documentary of the SA tour. The SABC have bought the programme and it will hopefully be aired in November. Live Fact released in South Africa. Theunis Engelbrecht plays songs from Live Fact on Punt Radio (on 729MW in Cape Town and 1332 MW in Gauteng) between 7 and 10pm. I don’t receive MW very well, but I heard Climb Up On Music just before 8pm. Rodriguez performs at the Blues Room in Johannesburg to launch the Live Fact CD. Rui De Sousa tells me that almost 9000 copies of Live Fact have been sold to date. Scan of the sound engineer’s set list, dated and autographed. 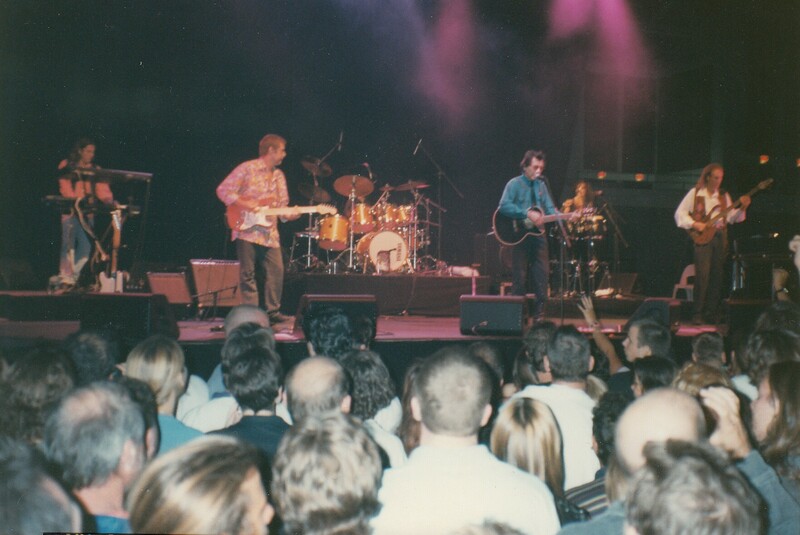 From the simplistic, yet instantly recognisable bass guitar intro of I Wonder, to the last fading echoes of Thanks For Your Time, this was a show that enthralled everyone from the die-hard old fans with their balding heads and beer paunches to the new virgin devotees. from disgusting songs to rock anthems…this was truly a magic show of vast proportions. Rodriguez has not released new material in over 25 years, he has no chart-topping singles, yet he opens to a standing ovation – and everybody sings along to all the songs. Reuben Samuels started a slow drum beat and when Graeme Currie introduced that classic bass line (de-de de-de de-dum) the crowd went wild in instant recognition and when The Man slipped quietly onto the stage, the Velodrome stood up in adoration for this long-lost legend. 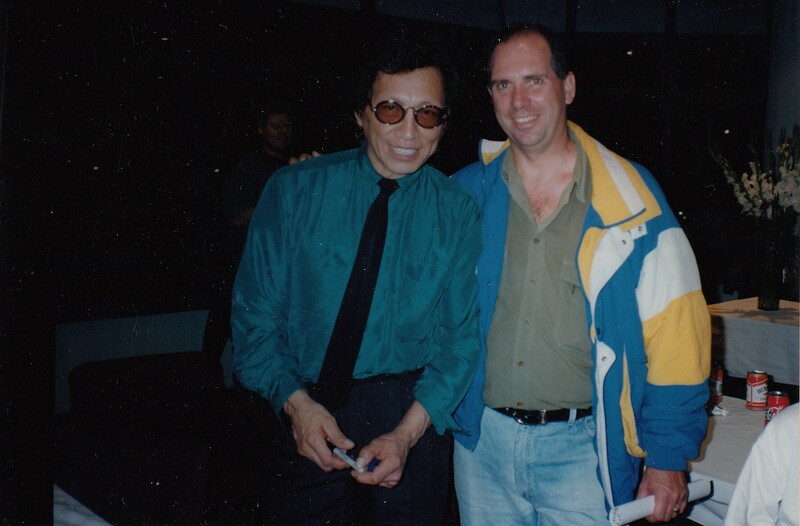 I Wonder was wonderful and after the song, Rodriguez just stood and stared at the audience in awe. Only Good For Conversation was done hard and heavy with great guitar from Willem Möller. “..you’re so proper and so cute” sang Rodriguez with a smile in his voice. Can’t Get Away was superb and when he started to sing the second verse again by mistake, the band supported him and the audience forgave him. All the favourites followed with the arrangements staying very close to the originals and the crowd hanging on every word. Tonia Selley from The Pressure Cookies and Big Sky provided superb backing vocals throughout. A highlight was the solo rendition of “A Most Digusting Song” sung with great humour. “There’s someone here who’s almost a virgin I’m told” was met with much laughter. And when he sang “…your government will provide the shrugs” a responsive chord was hit, even though this song was written in 1970! – perceptive and profound words from this poet and prophet. And then into an absolutely incredible blues-rock version of Climb Up On My Music. Willem Möller burnt up his fretboard with a classic rock guitar solo and Russel Taylor played a jazzy-blues keyboard solo which left us breathless. Rodriguez slipped away as the band ended the song, but soon returned to perform a 3-song encore starting with Sugar Man, then Establishment Blues and ending with the perfect show-closer Forget It with those poignant words “Thanks for your time“. 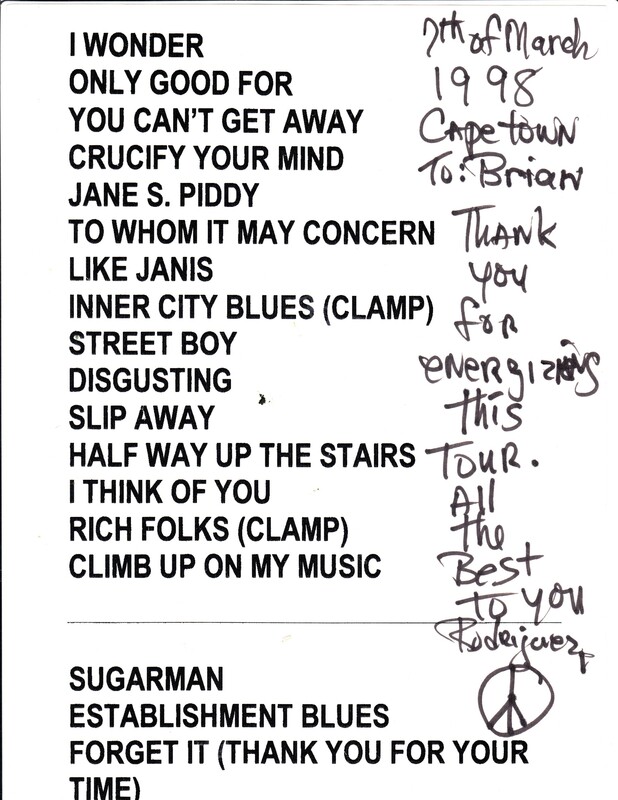 “Thank you, Cape Town” sang Rodriguez. No, thank YOU, Rodriguez – the mystery and myth may be gone, but the music and memories will live forever and the magic of that night will stay with us always.